Released in 1985, a Takatoku Macross VF-1S Super Valkyrie box set was repainted, repackaged, and released as Jetfire. Jetfire features three modes: robot, jet, and an "alternate transformation" that deploys his arms and legs in jet mode. Additionally, Jetfire comes with several red pieces of armor and rocket booster backpack that can snap onto his arms, legs, and back in any mode. Due to his Macross origins, Jetfire has considerably more articulation than the other Transformers in the line at the time. 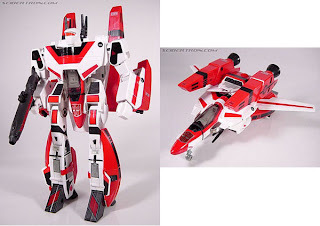 However, Jetfire was never released in Japan, since the toy was released by one of Takara's rival toy companies, Bandai, which owned Takatoku's Valkyrie Fighter license and had told Hasbro that they could only sell the Jetfire character in the U.S. but not in Japan. Thus, there was never a Takara-issued Jetfire. Jetfire is one of the TFs I coveted because of his amazing accessories and armor, as well as a gorgeous jet mode. It was thanks to Grimlock bro that I managed to secure this piece from an online ebay seller and at a pretty decent price too. Though it came in a box which has obviously seen much better days, the toy itself is in excellent condition with all the 11 pieces of battle armor complete. Jetfire is my fav piece of TF toy mainly cos it shared the same mould with 1/55 Macross VF-1S by Takatoku. I have three of these jetfire but non of them is as good as the one you have. I am very impressed with the one you are having.